1.Aerosols shall be in accordance with Chapter 51. 2.Flammable and combustible liquids shall be in accordance with Chapter 57. 3.Hazardous materials shall be in accordance with Chapter 50. 4.Storage of combustible paper records shall be in accordance with NFPA 13. 5.Storage of combustible fibers shall be in accordance with Chapter 37. 6.General storage of combustible material shall be in accordance with Chapter 3. 1.Floor plan of the building showing locations and dimensions of high-piled storage areas. 2.Usable storage height for each storage area. 3.Number of tiers within each rack, if applicable. 4.Commodity clearance between top of storage and the sprinkler deflector for each storage arrangement. 5.Aisle dimensions between each storage array. 6.Maximum pile volume for each storage array. 7.Location and classification of commodities in accordance with Section 3203. 8.Location of commodities that are banded or encapsulated. 9.Location of required fire department access doors. 10.Type of fire suppression and fire detection systems. 11.Location of valves controlling the water supply of ceiling and in-rack sprinklers. 12.Type, location and specifications of smoke removal and curtain board systems. 13.Dimension and location of transverse and longitudinal flue spaces. 14.Additional information regarding required design features, commodities, storage arrangement and fire protection features within the high-piled storage area shall be provided at the time of permit, when required by the fire code official. EARLY SUPPRESSION FAST-RESPONSE (ESFR) SPRINKLER. 3203.7.4Limited quantities of Group A plastics in mixed commodities. a.This figure is intended to determine the commodity classification of a mixed commodity in a package, carton or on a pallet where plastics are involved. 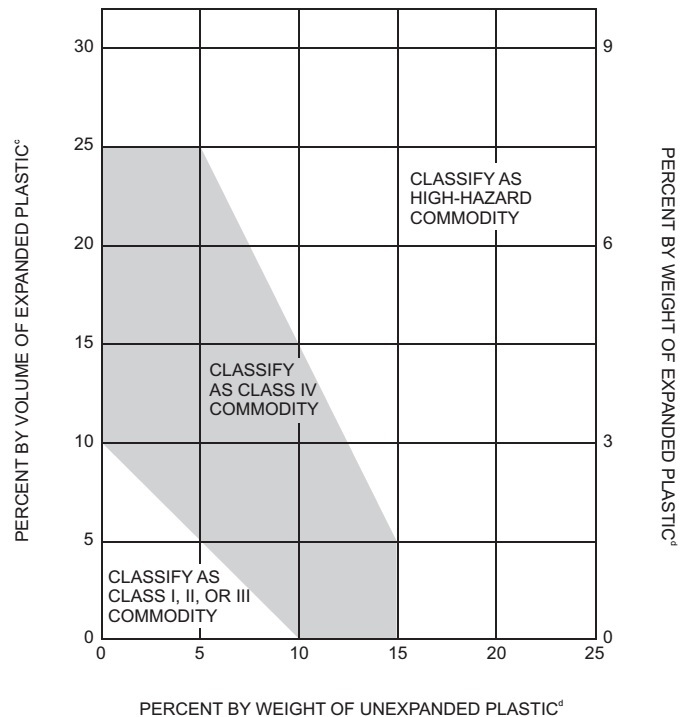 b.The following is an example of how to apply the figure: A package containing a Class III commodity has 12-percent Group A expanded plastic by volume. The weight of the unexpanded Group A plastic is 10 percent. This commodity is classified as a Class IV commodity. If the weight of the unexpanded plastic is increased to 14 percent, the classification changes to a high-hazard commodity. 3204.2Designation based on engineering analysis. 3205.5Pile dimension and height limitations. 3206.2Extent and type of protection. a.Where automatic sprinklers are required for reasons other than those in Chapter 32, the portion of the sprinkler system protecting the high-piled storage area shall be designed and installed in accordance with Sections 3207 and 3208.
b.For aisles, see Section 3206.9.
c.Piles shall be separated by aisles complying with Section 3206.9.
d.For storage in excess of the height indicated, special fire protection shall be provided in accordance with Note g where required by the fire code official. See Chapters 51 and 57 for special limitations for aerosols and flammable and combustible liquids, respectively. e.Section 503 shall apply for fire apparatus access. f.For storage exceeding 30 feet in height, Option 1 shall be used. g.Special fire protection provisions including, but not limited to, fire protection of exposed steel columns; increased sprinkler density; additional in-rack sprinklers, without associated reductions in ceiling sprinkler density; or additional fire department hose connections shall be provided when required by the fire code official. h.High-piled storage areas shall not exceed 500,000 square feet. A 2-hour fire wall constructed in accordance with Section 706 of the International Building Code shall be used to divide high-piled storage exceeding 500,000 square feet in area. i.Not required where an automatic fire-extinguishing system is designed and installed to protect the high-piled storage area in accordance with Sections 3207 and 3208.
j.Not required where storage areas are protected by either early suppression fast response (ESFR) sprinkler systems or control mode special application sprinklers with a response time index of 50 (m • s)1/2 or less that are listed to control a fire in the stored commodities with 12 or fewer sprinklers, installed in accordance with NFPA 13. 3206.3Separation of high-piled storage areas. 1.Aisles crossing rack structures or storage piles, that are used only for employee access, shall be not less than 24 inches (610 mm) wide. 2.Aisles separating shelves classified as shelf storage shall be not less than 30 inches (762 mm) wide. 3207.3Pile dimension and height limitations. 1.Racks with mesh, grated, slatted or similar shelves having uniform openings not more than 6 inches (152 mm) apart, comprising not less than 50 percent of the overall shelf area, and with approved flue spaces are allowed to be treated as racks without solid shelves. 2.Racks used for the storage of combustible paper records, with solid shelving, shall be in accordance with NFPA 13.
a.Three-inch transverse flue spaces shall be provided not less than every 10 feet where ESFR sprinkler protection is provided. b.Random variations are allowed, provided that the configuration does not obstruct water penetration. 1.An automatic smoke detection system installed in accordance with Section 907, with coverage extending 15 feet (4575 mm) in all directions beyond unenclosed carousel storage systems and that sounds a local alarm at the operator’s station and stops the carousel storage system upon the activation of a single detector. 2.An automatic smoke detection system installed in accordance with Section 907 and within enclosed carousel storage systems, that sounds a local alarm at the operator’s station and stops the carousel storage system upon the activation of a single detector. 3.A single dead-man-type control switch that allows the operation of the carousel storage system only when the operator is present. The switch shall be in the same room as the carousel storage system and located to provide for observation of the carousel system.